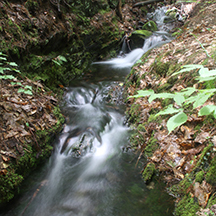 Streams are small watercourses that can usually be waded across. Those streams that flow throughout the year are called perennial streams. Those that flow for only part of the year are referred to as intermittent streams. Although many people view intermittent streams as relatively unimportant for fish and wildlife, studies have shown that season use of intermittent streams can be very important for brook trout and that the loss of these habitats (for example, due to a barrier such as a dam or culvert) can reduce the likelihood that brook trout populations will persist over time.